Available for download with iBooks on your Mac or iPad, and with iTunes on your computer. Multi-touch books can be read with iBooks on your Mac or iPad. Books with interactive features may work best on an iPad. Click here to buy & download for your Mac or iPad. You can also download a free sample in the iTunes store. This is so much more than a book! In addition to a wealth of information, it’s also a solid training manual. Most of all, it introduces Jaques-Dalcroze’s Solfège for the 21st century. 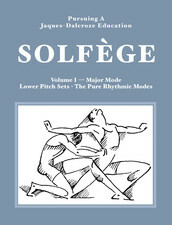 The iBook format makes Pursuing a Jaques-Dalcroze Education — Solfège an interactive course of study, with audio examples, illustrations and exercises. It’s a true bargain at just $19.99!